On a daily basis, I consult with patients who are searching for the secret to younger-looking, glowing, healthy-appearing skin. The discussion usually begins with my riffling through their shopping bags full of expensive moisturizers and serums that they’ve purchased from a leading department or health food stores. The discussion usually ends with me choosing one or two of these high-end creams that may have some positive impact on skin appearance and health. But, we also have to discuss the fact that the skin is a living organ. So, just as important as it is to treat one’s skin from the outside, it is also important that we nourish the skin from the inside in order to promote and prolong its youthful appearance. At PURE, we have mastered anti-aging skincare in the traditional sense with the development of Ciello, a revolutionary blend of peptides and botanicals that markedly reduce skin dullness, inelasticity, sun spots and other signs of aging. Besides maintaining a healthy, balanced diet, what else can we do to slow the signs of aging, while getting closer to that proverbial “fountain of youth”? One of the oldest antimicrobials known to man is elemental sulfur, which has historical references dating back as early as the Bible. It is used in over-the-counter and prescription acne medications and prescription antibiotics for its antibacterial and antifungal properties. Many people seek out the opportunity to bathe in natural hot springs, as it is believed that the sulfur content of these waters is helpful in healing skin irritations and rashes, and other ailments. Sulfur is also found in plants, human and animal tissues and is the most abundant element in the human body. The mineral is also known to be important for the synthesis of collagen, a major component of skin, hair and nails. Because our bodies cannot manufacture sulfur, it must be obtained in the diet from fruits, vegetables, grains, meats, eggs and poultry. Supplementing with Organic Sulfur may be helpful in slowing the collagen loss that results in the formation of fine lines and wrinkles, keeping the bacteria and fungi that cause blemishes at bay and growing longer, stronger and healthier looking hair and nails. Its nickname alone, makes the inclusion of Acaí Superfruit juice, a daily part of your skincare routine. Besides being packed with proteins, amino acids, vitamins and minerals, acaí is known as the “beauty berry” because it is high in omega-3 and omega-6 fatty acids and antioxidants. In fact, the fruit of the acai palm tree, native to Central and South Americas, reportedly has a greater antioxidant content than other berries most common to the American diet, including raspberries, strawberries, cranberries, blueberries and blackberries. Why is this important? To some degree our skin is going to age naturally over time, through normal quiescence of cells and breakdown of collagen and elastin, which gives skin its plumpness and smoothness. At the same time, aging can occur at an accelerated rate when we are exposed to free radical damage. Free radicals are produced from environmental toxins like tobacco smoke and radiation from the sun, or even the byproducts of digested foods. Antioxidants play a huge role in the body’s defense against the aging process by blocking free radical damage to our skin and other tissues. It is believed that ingesting antioxidants is just as important, if not more so, than applying them topically to the skin. Acaí Superfruit juice sets itself apart from other acai juice supplements by containing the juice of the whole fruit – pulp and skin. So, you get the maximum amount of the good stuff in its purest form. Like acaí, the goji berry or “happy berry” also contains antioxidants. Both fruits are high in omega-3 and omega-6 fatty acids, which are believed to be the two fats most important to good health. These fats are aptly named because they perform essential biological functions in humans and must be obtained from food — they cannot be manufactured in the human body. Besides being critical for good cardiovascular and neurological health, omega-3 and omega-6 fatty acids play key roles in proper skin functioning and appearance and in hair growth. In ancient Chinese medicine, the goji berry is well known for promoting a sense of calm and well-being, healthy sleep and longevity. Goji Superfruit juice contains pure goji berry juice undiluted and without other juice fillers. It is also high in vitamins A and C, two vitamins that are necessary for healthy-appearing skin and hair growth and for collagen synthesis. Remember we briefly discussed collagen above. It is the key to skin thickness in youthful skin. Vitamins A and C help to slow its age-related breakdown, delaying the onset of thin skin, fine lines and wrinkles. So, is there truly a fountain of youth? Probably not. But, Organic Sulfur, Goji Superfruit and Acai Superfruit may help bring you a little bit closer to it. Learn more about these products at livepure.com. 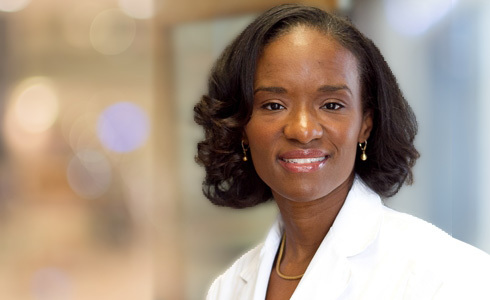 Dr. Tanya Reddick Rodgers, a PURE Wellness Advisory Board member, is a board certified dermatologist with extensive training in general, pediatric, and cosmetic dermatology, and dermatological surgery. She earned her Doctorate of Medicine at The Feinberg School of Medicine, Northwestern University in Chicago. She completed her residency training at Henry Ford Hospital in Detroit, Michigan, where she served as an integral part of the Multicultural Skin of Color Clinic designed to meet the unique skin care needs of all of those with skin of color, including the African-American, Asian, Latino, and Middle-Eastern communities. Dr. Rodgers is a Fellow of the American Academy of Dermatology, a Diplomate for the American Board of Dermatology, and a member of the Texas Medical Association, and the American Medical Association. Yo quiero (I want) tacos! Today is National Taco Day, and the perfect excuse to eat tacos for breakfast, lunch and dinner. Who doesn’t love this cumin-and-chili-infused, traditional Mexican favorite? Tacos are easy to throw together and so customizable. Plus, they can satisfy the the biggest appetite. Tacos are traditionally associated with fresh tortillas, ground beef, cheese and sour cream. Here in the U.S., taco dishes are as varied as life itself — from taco dip to pizza tacos to dessert tacos. 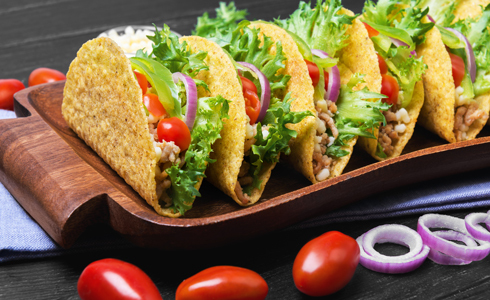 Tacos are rich in protein, fiber, calcium, iron and magnesium; however, depending on how you make them, tacos can be heavy on fat and cholesterol. Make your tacos healthier with the ten tips below. We also share some delicious taco recipes that incorporate some of our products. Make your own taco seasoning, or simply use lemon, lime and garlic. Store bought seasonings can contain too much sodium. Customize your tacos the PURE way. Use our products to create your own sauces or seasonings. Add Mila to your choice of meat as we do below in the meatloaf recipe. Do you have a favorite product you use to make your taco dishes? Share with us below. This recipe uses our micro-sliced Mila® — a super food that is gluten-free, trans-fat free, sugar-free, and is a superior plant-based source of protein and fiber. Mila uses different varieties of the chia seed to provide a wide array of nutrients. By combining these crops, you get a nutritionally robust product. Preheat oven to 350F and line a large rimmed baking sheet with tinfoil. In a large bowl, combine ground beef, micro-sliced Mila, taco seasoning, chili powder (optional), salt, pepper, eggs, 4 ounces of the cheese, and water. Mix with your hands to combine well. Shape mixture into a long, low loaf. Sprinkle top with remaining 2 ounces grated cheese. Bake 50 to 60 minutes, or until a thermometer inserted in the center reads 135F for medium. Remove and cut into slices. Top with your favorite taco toppings such as sour cream, chopped tomatoes, and avocado. Goji superfruit is a dark, delicious juice with a tinge of sweetness. As a natural source of vitamin C and polysaccharides, Goji provides nutrition to help support healthy functions of the immune system. Goji is also is a source of carotenoids, including lutein and zeaxanthin, which can help enhance eye. Stir tomato sauce, water, Goji, cumin, onion powder, garlic powder, garlic salt, chili powder, paprika, sugar, and cayenne pepper together in a saucepan over low heat; cook at a simmer until slightly thickened, about 20 minutes. Cool sauce slightly before serving. How do you enjoy your taco dishes? 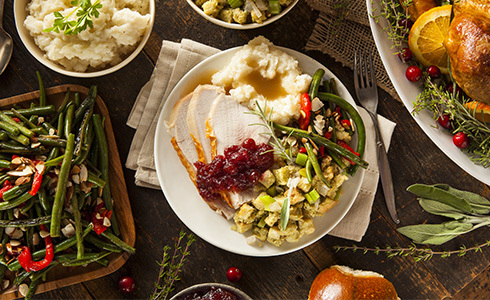 Share your recipes with us at http://livepure.com/recipe-submission.